The name of the place and surrounding lawn are still in fine shape. 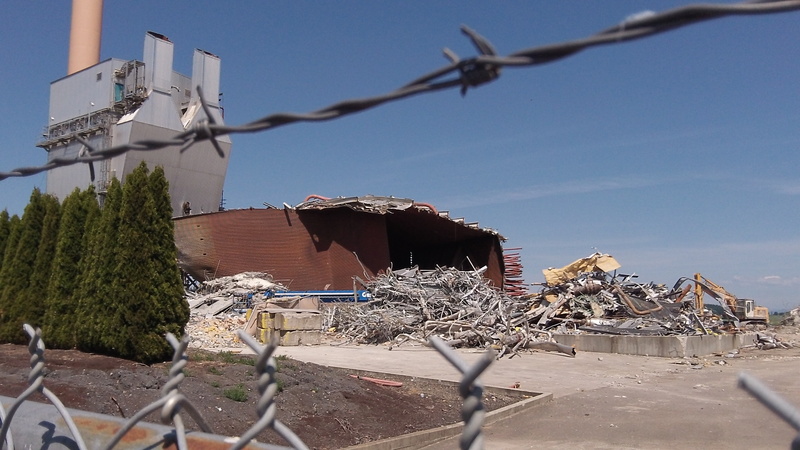 Not much is left of the Albany Paper Mill in Millersburg except for an exhaust stack and piles of metallic debris. But the name at the former entrance off Old Salem Road remains, and it’s surrounded by a patch of well tended lawn. It’s as though somebody wants to keep our memory of the mill alive for as long as he can. Piles of metal and the remaining structures. The state-of-the-art mill, which made linerboard paper from sawdust and recycled cardboard, had been owned in turn by Western Kraft, Willamette Industries and Weyerhaeuser before it passed into the hands of International Paper. It was closed at the end of 2009, with the loss of 270 jobs. In January 2012, the Albany Democrat-Herald ran a story saying demolition was about to start and should be finished in “early 2013.” The story named Frontier Industrial as the contractor, and that company, which does large-scale demolitions all over the country, may still be in charge. 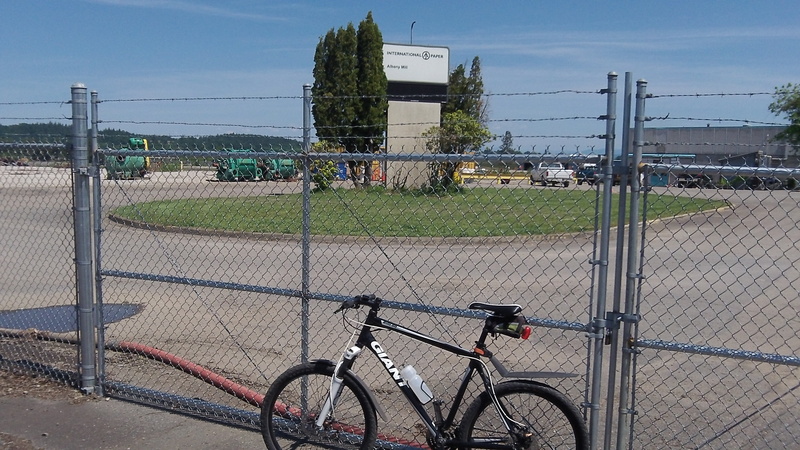 I was a construction foreman on the secondary fiber project in the mid ’90’s at that mill when Willamette Industries still was its owner. I recall how there were two huge (4 foot + diameter) water lines running deep under one of the buildings we were constructing in a north-south direction. To protect those two lines from damage, one of the foundation walls we built was 18″ thick and almost 30 feet deep. The water lines fed the paper machines to the north of our project. What I’m wondering is: What is the status of those two lines? Their capacity is enormous. Are they being abandoned also? Or will they be a possibly attractive piece of infrastructure to whoever buys that property? Ordinarily, when a building (or a plant) is demolished, all improvements are removed including foundations and the property is returned as much as possible to its original, pre-construction state. I also wonder if they removed that deep section of foundation. That was one big mass of highly reinforced concrete, deeply embedded in the ground. Not easily removed…..probably cost more to take out today than it cost to build it 20 years ago. I’m not thinking you can get answers to this question. Just curious……. Just so sad. I grew up in Jefferson, and many of my friends parents made a good living and provided form their families by working in the paper mill. Not much else to say, other than I wish it had turned out differently. Thank you. I appreciate your follow-up on my inquiry about this. Mr. Carrick’s comment about the “buried” concrete was of interest too.